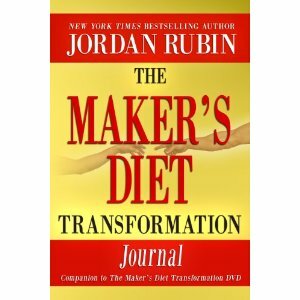 “The Maker’s Diet Transformation Journal” is designed to be used with “The Maker’s Diet Transformation Curriculum.” The book includes a plan for a ten-day interactive experience of transformation resulting in: Creating healthy patterns and disciplines, break additions habits and unhealthy cycle that have been holding you back, lead to new dimensions of empowerment in your Bible study and prayer, see prayers answered, and to find God’s purpose for your life. New York Times bestselling author Jordan Rubin challenges the reader to become a part of a generation of “Daniels;” people willing to become an extraordinary sphere of influence for God in a broken world. Each day in is broken into three segments which include a Corporate Prayer Directive, a scripture, a devotional challenge, and an opportunity to record your thoughts in your prayer journal, at the beginning of the day, in the afternoon, and in the evening. “The Maker’s Diet Transformation Journal” is for Christians sincerely wanting to: Experience a deeper intimacy with God, develop a more effective prayer life, and establish a renewed purpose and vision. “40 Days to Reclaiming Your Soul” is a devotional adventure in finding freedom from destructive relationships, unhealthy emotional attachments, and negative perceptions. The book is designed to be used with “Reclaim Your Soul.” It is made up of 40 daily devotionals that help the reader put into practice the disciplines introduced in the book; disciplines in self-discovery, establishing identity, and developing behaviors that lead to living a resilient lifestyle. Each of the 40 day devotionals include a daily discipline, reflective questions, activation exercises, and an empowerment prayer. These components enhance the reading experience to another level of spiritual understanding, application and, beyond simply reading for information and knowledge. The scripture passage, reflection, and empowerment prayer, incorporate and re-enforce specific actions that can be taken in a direct relation to the discipline of the day. Disciplines range from attributes and alliances, contending for versus competing with, to pursing purpose and pursing God’s presence. 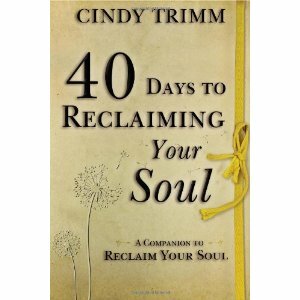 “40 Days to Reclaiming Your Soul – A Companion to Reclaim your Soul” is a powerful spiritual growth resource leading to building and rebuilding relationships, emotional healing, and a positive change in attitudes. Foundational, transformational, character building, and Christ honoring. A complimentary copy of this book was provided for review purchases. The opinions expressed are my own. “A Practical Guide to Walking in Healing Power” is a companion to Chris Gore’s book “Walking in Supernatural Healing Power.” The concepts and foundational truths introduced in the book are further developed to address root issues that hold individuals back from experiencing the supernatural flow of God’s grace. Each session is comprised of a clearly stated objective, notes and discussion questions, and activation exercises for individual, small group, or classroom study. Adequate space is provided for recording insights, observations, and reflections on these core truths. This feature allows the participant to personalize the study as an important resource for charting progress, further assimilating the material, and for application and putting into practice the principles learned. Gore is passionate about commissioning and equipping ordinary people to experience an extraordinary life and ministry of supernatural healing and miracles. Gore is articulate, a gifted communicator, direct in his approach; his material is well organized in a logical progression, in a user friendly format. “A Practical Guide to Walking in Healing Power” is an important resource for every Christian wanting to experience the fullness of power available through the indwelling spirit of Christ. A Powerful message that presents practical principles for dynamic discipleship. “Families on the Gallows of Criminal Justice” is the story of the birth of Mercy Heart, a ministry to at risk families and children of inmates. Testimonies from former inmates, their spouses, and family members tell of how they have been ministered to in areas of redemption, recovery, and restoration. Part One establishes the crisis families of the incarcerated are facing: including: The loss of income, family and friends, and the emotional and psychological issues they experience. Chapter two describes the birth of the Mercy Heart program and challenges the reader to become involved in a similar outreach ministry in their own church. Part Two provides a model for starting a Mercy Heart Chapel Program; with action steps for establishing the ministry, enlisting and equipping volunteers, evangelism, and church planting. On a lighter note Hollar includes some “Texas Wisdom” notes to re-enforce the important principles presented in the text. The photos provided throughout the book add a visual impact imparting an added dimension of vision and challenge. The helpful forms included on an accompanying CD provide tools which add to the value of this manual as a continuing resource for a successful ministry. 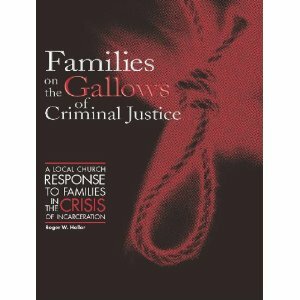 “Families on the Gallows of Criminal Justice” is an important manual for every church and faith based ministry reaching out to families in crisis as the result having an incarcerating loved one. Highly recommended. In his novel “The Sinner’s Garden” William Sirls skillfully incorporates a small town’s secrets and fractured relationships as they intersect with supernatural intervention, miraculous healing, redemption, reconciliation, and new hope. A helpful Reading Group Guide is included with heart searching questions for stimulating discussion. “The Sinner’s Garden” promises to insure new fans for William Sirls and has the potential for making an impact on building the faith of the reader. Highly recommended. I was provided a review copy of this book for review purposes. The opinions expressed are my own. Part Two is made up of 40 disciplines that lead to resiliency. These disciplines are designed to help the reader in an adventure of self-discovery, establishing identity, and developing behaviors and habits essential to living a truly resilient life style. Trim helps the reader understand how destructive relationships, negative perceptions, and unhealthy emotional attachments hinder spiritual growth, undermine self-worth, make it impossible to be the person God intended and to fulfil His life purpose for an individual. Each power packed chapter begins and ends with a promise from Scripture a power quote from a recognized leader or a reflective quote from a well-known spiritual giant. Trimm has an amazing gift for communicating spiritual understanding and Biblical teaching into practical principles for empowerment. She writes with conviction, passion, and authority. 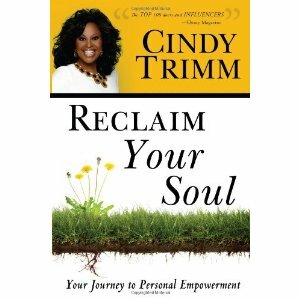 “Reclaim Your Soul: Your Journey to Personal Empowerment” is must reading for anyone wanting to successfully live out their God ordained purpose. As the subtitle suggests “When Heaven Invades Earth for Teens” is a guide to help the reader realize their supernatural power, and understand the scope of God’s mission for today while using God given gifts and talents. Bill Johnson and Michael Seth collaborate in this effort to provide practical life principles to teens so that they can manifest God’s power of faith and prayer to transform their heart, prepare for spiritual battle, and to encourage them to adopt a Christian worldview and a lifestyle of Kingdom living while sharing the message of the Gospel. Each chapter includes clear Biblical teaching and concludes with important thought for prayer, worship, and fellowship with the heavenly Abba (Dad) Father, probing questions for journaling and reflection, and suggestions for meaningful action steps to accomplish a mission objective. The book is ideal for personal study or easily adapted for small group use or use as curriculum in church youth classes. “When Heaven Invades Earth for Teens” provides the reader is a Kingdom adventure leading to power for the journey, for the mission, and power for the impossible. Most importantly the authors introduce a new generation of readers to the source of true spiritual power.